Downloaded from ModBritNat, reproduced in full for public information. 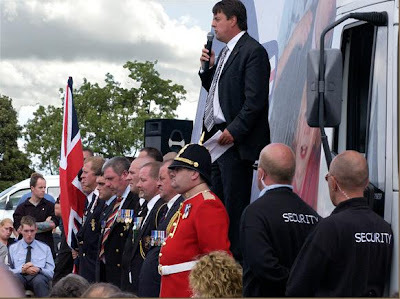 BNP Chairman Nick Griffin's keynote closing speech at the Red White and Blue Festival on Sunday 17th Aug 2009. This is an important speech where Our Chairman reviews the current political situation and explains why the role of the BNP and all its members is so important. This was a superb speech but as usual - I do nothing without a reason. Well that is not completely true. Sometimes I will just wander off and do something else - like type this sentence for no reason. Now there is a part in this speech that I will be referring to, in hopefully the very next article. I am listening to the speech now in order to find the "time in" for those of you who do not have time to listen to it all. Got it. It is the second segment. Please listen to it and understand what Our Chairman is saying.